is instead mostly fantasy about us." 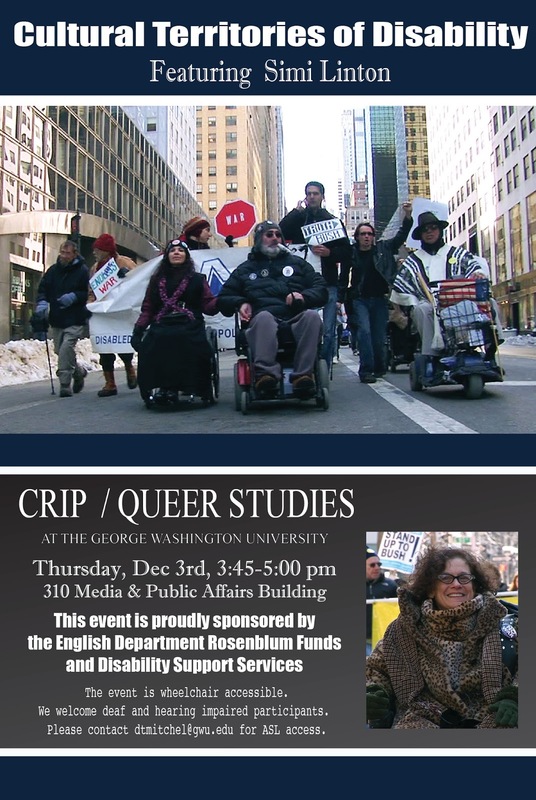 On December 3rd, 2015, Simi Linton spoke to a collection of several classes, as well as faculty and students in GWU's Crip/Queer Studies contingent. Her remarks, which she entitled, "Cultural Territories of Disability," took on the form of a seminar style dialog with the audience. Over the hour and a half, she examined the history and current contexts of disability in the public, the role of disability arts in democracy, and engaged students with a screening of some of her films that illustrate the lived affects art has on people with a diversity of embodiments. Professor David Mitchell introduced Linton and explained that her work has already been an influential part of his course which was now in its final weeks. Indeed, the event was a special treat for students who were able to receive a clarification and continuation of thoughts they had been stewing on all semester. Throughout her talk, Linton expanded on what she meant by "bringing disability activism into the democracy through the arts." Turning back to the audience, she opened up the questions to the audience, "what is democracy?" and, "how does art influence disabling systems of power?" Various responses were offered, ranging from the formal center of government, major corporations, the media, and the micro-encounters of daily life. Democracy as an idea is then more than a mode of ruling a nation but a way of looking at society as made up of micro-communities of power that are constantly in flux. In such a view, it is not enough to simply pass legislation or elect representatives, but transform needs to occur along massively distributed and systematic channels. It is along these channels that power flows, in contrast to other theories of social interaction that put a greater emphasis on centers or organs of authority. As much as disability justice needs to penetrate these bastions of rulership in order to effect change, it also needs to effect the network of ideas, emotions, and daily acts that are not localizable to one place or person. Power exists between people, not merely in them. At the start of her talk, Linton explained how her first book came out of a dinner at a restaurant with the desire to portray disability as an active mode of embodying the self and society rather than a passive state. As a discerning period, Linton decided that working in the academy would put too many limitations on her time, work, and conversations. In the end, she decided to leave the ivory tower of teaching, "to bring disability into the public" and use the arts to reorient societal orientations, "the cultural authority of disability." 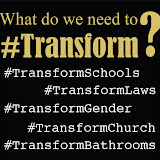 Disability justice requires mass participation in order to transform the physical and societal environments that disable those with non-normative embodiments. As Linton brought the audience into the conversation on disability culture, she spurred competition between classes in order to get a diversity of vantage points and to push the attending classes to see crip cultural authority as a good worth fighting to develop. At another stopping point, Linton and Mitchell discussed disability justice as working to move beyond the compulsory struggle "to be like the able-bodied" and to move instead into offering distinct vantages and goods as different kinds of crip bodies. This form of disability studies effectively is about a change of perspective, turning from exterior social view of disability to seeing the self and society from the disabled vantage. This "vantage," Linton stresses, combines a better understanding of crip knowledge (i.e. vantage points, the places and modes of how people perceive) and of crip power (i.e. advantage, the areas in which crip embodiments are better attuned to the world; perhaps suggestion a new way of conceiving of the "dis-advantage" of "dis-ability"). 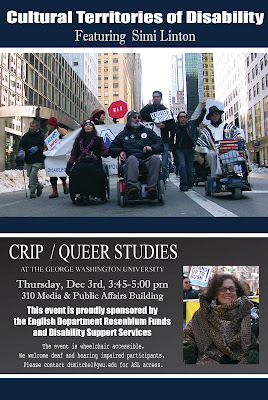 An implicit part of this shift in crip culture and justice is the movement of disability from being an object of study for those in the center of cultural authority to placing disability in the center of things then reviewing and reorienting from that vantage. Over the years disability representation and accommodations have increased under the banner of "multiculturalism," admits Linton, but observes that people often mistake and undermine what it means. In regards to the current state of multiculturalism in arts and the democracy, especially as it relates to disability, Linton notes, "more people know what multiculturalism is against rather than what it is for." As with feminism being portrayed as mere antagonism to men and masculinity, people (especially people of privilege) see multiculturalism as a demanding force (much like a whining child) to which they must continually make concessions. By this view, diversity is that ever present nag that invades the media and communities of straight, white ablebodied cisgender men and takes away things from them bit by bit. They frustratedly ask, "when is it enough for you people?" Yet this attitude shows that despite the little accommodations made, those people in power have not changed their sense of values. Disability and diversity (whether its women, people of color, queers, or trans people) remain groups of "others" who are less and have less than them. This vantage refuses to see diversity itself as a strength or the gifts that diverse peoples possess. But this concession of ideology would require the admission that for all their power, people of privilege are actually less able, less knowing, less rich than those over which they lord their whiteness or normativity. Once the admission is made, "their difference from me has value, authority, and power," suddenly disability and diversity becomes something to be desired and welcomed, not merely accommodated. The need for the transformation of democracy is evident then not only in the big injustice of government but in the "micro-aggressions" that occur in every day life. Working with a term that has received some use and misunderstanding, Linton defines and nuances meaning of micro-aggressions as the daily acts of ableism that occur despite major social victories. Often, in fact, the "backlash" after concessions are finally made (however small) to disability justice can drastically increase in number and forms after a few major concessions. One example that Linton called on to illustrate this is what she calls, "the Architecture of Exclusion." She defines this as architecture that reflects a dismissal, devaluing, or even frustration with disability as a result of unwillingly making the concessions to design, such as ramps or automatic doors. In one case, documented in one of her films, the ramp of an art center was so hidden that it not only took her away and out of sight from the public (as if she in her wheelchair was a problem for the building's aesthetic) but was covered and narrow so that she felt isolated and confined. The ramp did not allow for her to travel alongside friends and thus cut off her ability to converse with others who used the ramp with her. Evidently, the ramp was not built for the pleasure of people in wheel chairs and indeed wanted them out of the way as much as possible. The cumulative effect was that she felt alienated and marginalized by the building's unwelcoming layout at the same moments concessions are being made. at the George Washington University"
As a writer, consultant and public speaker, Simi Linton is one of America’s foremost experts on disability and the arts. She works with a diverse range of cultural organizations – theatre companies, film and television producers, museums, non-profit arts companies, universities, and other groups across the country – to improve and increase the way disability is represented and depicted in all art forms.